 Have a cherry juice tonic to celebrate Washington’s birthday (photo by Liv Friis-Larsen | ISP). 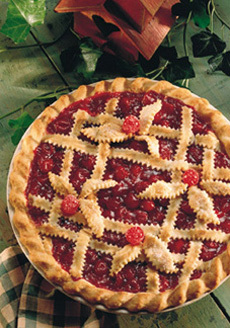 Cherry pie is always welcome (photo courtesy Cherry Marketing Institute). 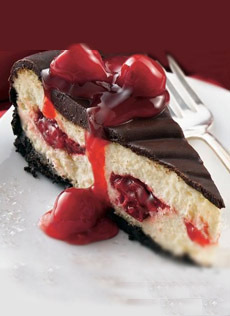 Cherry cheesecake with chocolate glaze. Here’s the recipe from Betty Crocker. America’s first president, George Washington, was born on February 22nd. While we now know the story about the cherry tree to be myth, the tradition of enjoying a cherry pie or other cherry foods doesn’t have to get tossed dut with it. If you follow American history, you may know that a number of facts attributed to George Washington were made up after his death. Washington did not throw a silver dollar across the Potomac River. Not only is the Potomac more than a mile wide—and an Olympic discus champion might falter at that distance—but there were no silver dollars when Washington was a young man. He did not chop down the cherry tree and then say to his father, “I cannot tell a lie.” Ironically, this story is itself a lie, made up by Mason Weems, an early biographer of George Washington (and a parson, no less), to illustrate Washington’s honesty. Here are more fun facts about Washington. Celebrate the day with this Cherry Tonic (photo #1). You can adjust the proportions of the drink to please your palate. 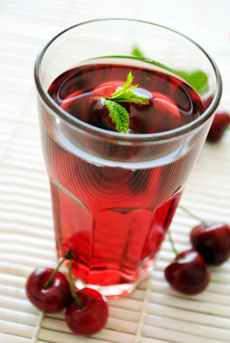 For a deeper cherry flavor, use more cherry juice and less tonic water. You can make the drink alcoholic with gin, tequila or vodka. If you prefer a beer: George Washington brewed his own, including pumpkin ale. He also enjoyed hot chocolate and egg nog. 1. ADD ice to a highball glass. If using cherries, place 4 or 5 of them on top of the ice. 2. POUR in a tonic water, to 2/3 of the way up the glass. 3. TOP off with tart cherry juice (our favorite is R. W. Knudsen Organic Just Tart Cherry juice). Stir. 4. GARNISH with a lime wedge and serve.